The varied and randomly placed collection of candles offers an image of our varied and un-pigeon-holed lives—all of which bear the light of Christ within. Not able to feel the “Holly-jolly Christmas” mood? The Blue Christmas service recognizes that for many the holidays are a particularly hard time—perhaps because of a death or other loss, because of family tensions, or just the weight of expectation to be joyful when for whatever reason life is sad. In this service, together, we can recognize this truth, support one another, and begin to taste God’s care in all the reality of our lives. Advent is the season of anticipation, waiting, preparation. Interim ministry resonates strongly with this time. Part of preparing for new possibilities is both claiming and releasing present realities. There’s a tension here (isn’t there almost always?) This congregation is in an in-between, both-and place of deeply engaging with our shared ministry right now while also looking ahead toward a possible search and call process and settled, sustainable leadership. Yup, this is Advent stuff—the time in the church year when we particularly recall that God’s reign is both already present and not yet fully realized. One of the Advent traditions is assigning themes—hope, peace, joy, love—to these four Sundays leading up to Christmas. One way we can try to dwell faithfully in in-between, both-and times is to back off a bit from struggling to figure things out, trying to nail down a meaning for these themes. Instead, we can rest a bit with non-verbal modes of presence. To that end, I’d like to offer to your imagination some images for Advent. I’m giving you words to call up images, because the best pictures are often in your own memory and imagination. So, as part of your Advent preparation, I invite you to take a few moments with these now, and dwell with each further on these Sundays and throughout the season. Hope—a bit of green sprouting out of a dung ball. Peace—a baby fallen asleep at its mother’s breast. Love—the whole chocolate chip cookie, of which we are the bits. Joy—a spring-snowmelt-rushing stream dappled in sunlight. The Advent season, a time of preparing for the coming Christ child, begins Sunday, November 29. As has become our custom in recent years, we will have a Hanging of the Greens service on this first Sunday of Advent. As we sing Christmas hymns and read scripture the sanctuary will come to its seasonal trim all around us. We will also have special music provided by my father Al Graves who is visiting from St. Louis. Join us for this special service and begin the Advent focused on the stories of our faith. 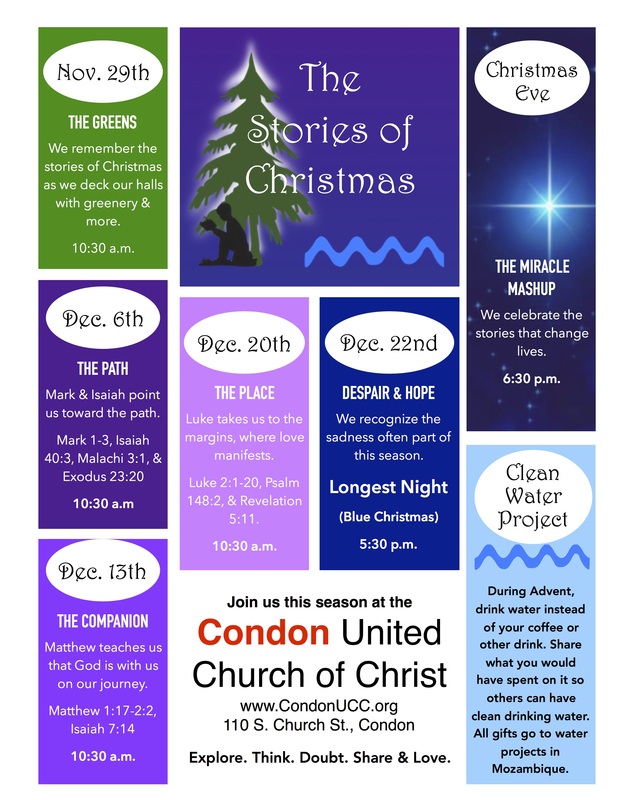 Advent, the church season leading to Christmas, will focus on “The Stories of Christmas” at the Condon United Church of Christ. Advent begins Sunday, Nov. 29 with a Hanging of the Greens service at 10:30 a.m.
“We all have stories,” says Rev. Tim Graves, pastor of the Condon United Church of Christ. “Stories are a way of making sense of the unpredictability of human existence. The Christmas stories found in the gospels helped people to understand who this man Jesus was, according to Rev. Graves. “We will explore the various stories and why the gospel writers contradict one another. Why, for example, does Luke tell us about shepherds and Matthew talks about the magi?” he says. The Hanging of the Greens service this Sunday, Nov. 29 will feature Christmas hymns, scripture readings, and special music by Al Graves, Rev. Graves’ father visiting from St. Louis. By the end of the service the sanctuary will be fully decorated for the season. Local musician Dan Robinson will provide special music for the Dec. 13 Sunday morning service. “Dan’s guitar playing is always a joy to us,” says Graves. In addition to 10:30 a.m. Sunday services throughout December, a Longest Night Service will be held on Dec. 22 at 5:30 p.m. 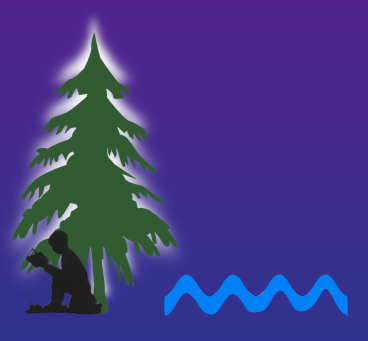 Sometimes called Blue Christmas, the contemplative service recognizes that this time of year is difficult for many people. The pressure to be joyful, memories of lost loved ones, or current struggles make this a difficult time of year for many, according to Graves. A candlelight Christmas Eve service at 6:30 p.m. The stories of Christmas will come together in what the church is calling “The Miracle Mashup” celebrating the birth of Jesus. For more information call 541-384-3681, email condonucc@gmail.com, visit condonucc.org or facebook.com/condonucc. Click here for a downloadable flyer of events of the season including scripture references. Get ready for a different kind of Advent and Christmas this year. Christmas Eve Service at 8 p.m.
We’ve searched during the Advent season for hope, for peace, for joy, and for love only to have the Extravagant One come to us in the most unlikely of places. The Divine has become incarnate in our midst. The Divine has been born of human flesh among us and within us. Into the silent night, the Divine comes to us as a poor infant living on the margins of society! Join us for worship at 8 p.m. on December 24th!